You are here: Good Beer, Good Pubs > Blog > Beers > Is it Hophead, or is it Hophead? On a recent routine trip to a couple of pubs in the Holborn area of London I came across a beer called Hophead at the Knights Templar – the Wetherspoons pub in Chancery Lane. Now those of you who know me, and indeed those of you who don’t might assume that I was talking about the Dark Star beer which has become prevalent in London these days. But no! 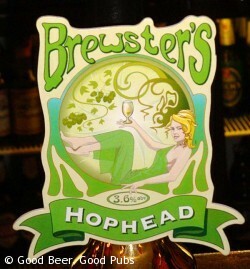 I was amazed to discover another Hophead on the street – this one from a brewery called Brewsters of Lincolnshire. Well, I had to try that. I found the Brewsters Hophead a very bitter beer but very light, and it has a similar aftertaste to the Dark Star beer of the same name. But obviously it was a completely different beer. I suppose I shouldn’t be surprised that a hoppy beer would be called Hophead – after all, if the beer was called Best Bitter or Summer Ale for example there wold be no confusion because the brewery would be a key part of the name. But I was a bit confused. A little research afterwards suggests that Brewsters Hophead might have had the name before the Dark Star beer. Anyway, the branding (pump clips etc) is totally different so I don’t think anyone would really make a mistake.